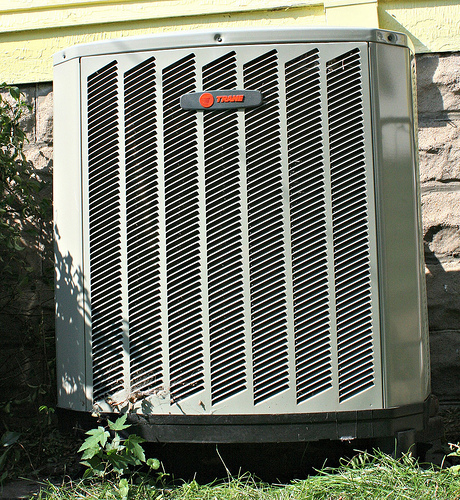 Home Costs > How Much Does an Air Conditioner Coil Cleaning Cost? How Much Does an Air Conditioner Coil Cleaning Cost? An air conditioner coil cleaning is recommended every year to make sure that the air conditioner is running efficiently. The cost of having the coils cleaned will depend on the service professional you choose, which coils need to be cleaned and the geographical location. On average, a professional air conditioner coil cleaning is going to cost anywhere from $125 to $225 per coil to have it cleaned. If you get both coils cleaned in one service call, the costs will usually be no higher than $450. The inside coils, more often than not, will be more than an outside coil due to the labor involved. An inside coil, unlike the outside coils, will require removing more parts to access it and clean it properly. As part of a maintenance package, if you were to take advantage of one with a local HVAC company, the costs could be as little as $59 to $159 if the coils were cleaned in place. However, if the dirt was deep in the coil, then the refrigerant lines and other parts would have to be disconnected in order to access the coil to remove the dirt. In this scenario, you could pay as much as $300 to more than $450. To get an exact quote in your area, consider getting multiple quotes for free from reputable and licensed contractors in your area by using HomeAdvisor.com. For example, one forum member on this MrLandlord.com forum said he was charged $326 to have the coils cleaned and wanted to know if the charges were fair. According to the responses, the price was fair as some were charged as much as $400 to have the coils cleaned. Both condenser (outdoor) and evaporator (indoor) coils will need to be cleaned at least once per year, according to the HVAC experts. As time goes on, dust, pollen and moisture will settle on the coil, and if you fail to clean the coils, it can settle and impact the ability to transfer the heat, which in turn, can destroy the air conditioner. Dirty coils can also attract bacteria and mold that can affect the air quality. During a basic cleaning, a technician will check the coil for damage, use gauges to measure temperature flow and use a chemical cleaner to clean the evaporator. The inside coil will usually be sanitized and cleaned. If any additional repairs are noted during an inspection, other fees may apply. Some people often think the coil has to be cleaned but in reality, the entire coil has to be replaced. If this were the case, the costs could reach into the thousands. If a technician has to travel outside of his travel zone, a mileage surcharge may be tacked on. Many times when you have your air conditioner cleaned, the technician will suggest changing the filter at the same time. This will be an extra cost, but should not be more $20 or so. An air conditioner with a dirty coil can use up 40 percent more energy than a clean coil. Even though cleaning the air conditioner is an upfront cost, it can save you money on a monthly basis. Do not judge a coil by its appearance. There will be times when a coil looks clean but may not function like it should. Try to get your air conditioner cleaned at least every other year. If you have not had your coils cleaned in a few years, it is probably best to make the service call. Failing to do so can lead to a potential malfunction or failure. Cleaning your coils will actually save you a lot of money in the long run. In fact, you can recoup most of your costs within the first year alone with your average energy bill. Plus, a clean system is going to last longer. For the DIY-er, foam-based cleaning agent sprays are available for less than $15 online. This foam will be sprayed on the coil and the foam will wash the emulsified matter off, requiring no rinsing or tearing apart your air conditioning unit.